Thrive dehydrated chopped onions come diced and ready to use in your favorite dishes. Thrive Chopped Onions will give a boost of delicious flavor to any of your home-cooked meals. Include Thrive Chopped Onions in your everyday home cooking and you will create savory meals that have the added benefits of a vitamin C and dietary fiber. Thrive Chopped Onions are perfect for flavoring warm soups, baked casseroles, spicy salsas, and many more of your favorite dishes. 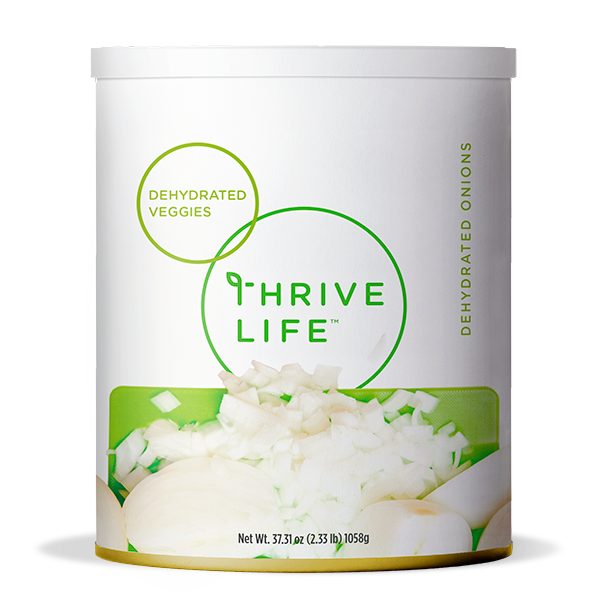 You can also try using Thrive Chopped Onions dry to really enhance the flavor of dips, mixes, and sauces. Add 1 cup of water to 1 cup Chopped Onions; let sit until tender. The dehydrated onions are chopped slightly larger than the freeze dried. Unlike freeze dried onions they’ll grow in volume after reconstitution, so use less than you would with freeze dried.